Since 2014 our twin values as an administration have been ambition and fairness. To bring our labour values to the forefront of the decisions we make. To ensure a better and fairer Lambeth for all our residents. Tonight our budget achieves that. For the first time we are exempting children leaving care from council tax up until they reach 25 years old. We are continuing to provide council tax discounts to 30,000 of our most vulnerable residents and to introduce a special hardship fund to help anyone impacted by changes to it. We are investing in new schemes to buy up homes for homeless families in partnership with the Mayor of London and other boroughs. And we are continuing to protect the number of beds funded by our pioneering violence against women and girls services. We have taken the difficult decision to put council tax up -; not an easy as we know it is an unfair tax – but it is the right decision to protect the services that our most vulnerable residents rely on. And even after tonight’s rise council tax in Lambeth will have the ninth lowest council tax in London. I think this is some achievement eight years into this Tory government’s austerity programme. That austerity has forced Lambeth to find £238 million in savings -; more than 3 times our entire children’s services budget. And that has brought councils across the country to their knees – Tory Northamptonshire, is the first to go bust. 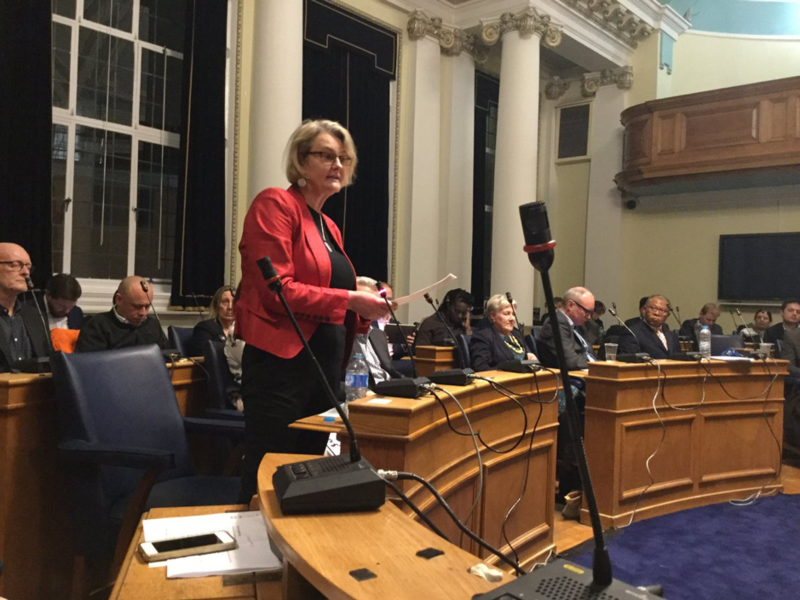 Despite all the huffing and puffing from the green popular front -; the Peoples Audit – Labour Lambeth will avoid this plight due to careful financial management which has become the hallmark of Lambeth over the last decade. Madam Mayor, ambition and fairness have been our driving values over the entirety of this administration. Ambition for our borough with thousands of new jobs created, the best rate of new business growth in London and the highest employment record ever. With our transformed town centres supported by our fantastic green spaces -; now flying 14 Green Flags for excellence. With the biggest investment in our roads, pavements and cycling infrastructure ever. And fairness with significant innovations in mental health such as the Lambeth Living Well, Black Thrive and Lambeth together alliance. With our early support for becoming a Lambeth Living wage employer meaning that now 99% of our contracts are at the London Living Wage. And our support for the 20 refugee families settled in Lambeth having fled conflict in the Middle East. That is to say nothing of our outstanding environmental record that Cllr Trepass spoke so eloquently of. Or the ever improving story of our schools that Cllr Prentice spoke about at the last council meeting. Or our housing record -; the number one priority of residents. Cllr Morris decimated the opposition’s record at January’s meeting of saying one thing and doing the exact opposite. I am proud to lead the first administration in a generation to build council homes, where our affordable housing record exceeded its London target last year, and where our investment in council housing of £480 million unrivalled by any previous administration. Where there are been problems, rather than avoid them we have tried to confront them, get under the skin of the issue. We set up the Equality Commission to draw up 63 recommendations for action to improve the opportunities for all our communities. Where there are acute financial challenges we decided to be entrepreneurial rather than take the approach of many other local authorities & just close services. We still have 23 children centres open and despite the fake news that crops up on social media we have defended our 10 libraries. Yes defended, and so many people have said this week how great Carnegie looks. And where there was a terrible stain in our corporate Lambeth history -; the industrial scale of historic child abuse carried out in Lambeth’s children’s homes – we have confronted it rather than ignored it. We cannot make good what dreadful things have happened in the past but we can, and have, acknowledged what happened, on behalf of Lambeth we have made a full and genuine apology to survivors, and we have put in place a non-adversarial redress scheme and counselling support, the first of its kind in the UK. None of this just happens. These are Labour councillors leading, inspired by our values -; Labour values, informed by our residents. Whatever this government throws at us we will keep standing up for our residents. Unlike the unholy alliance of Greens and Tories over there we will talk up the borough. We want to be representatives for Lambeth and we are proud of what Lambeth staff and residents can and do achieve together. Over the next few months we’ll put forward a radical agenda and stand on our record of achievement. We know that only Labour can deliver a Better, Fairer Lambeth for all of our residents.